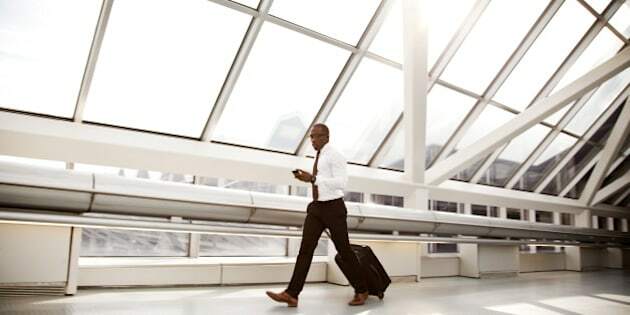 A well dressed businessman walking in an airport with a suitcase and a tablet device. Way back when airline points were introduced you needed to actually fly to earn them. Nowadays you can rack them up for doing just about anything -- buying groceries, paying bills -- and now, even walking. In a very smart move and partnership with health insurer nib, Qantas has announced that you can earn points on its Frequent Flyer program simply walking, running and generally being active. The catch? You need to sign up for its new health insurance product, Qantas Assure. Endorsed by The National Heart Foundation, customers who take out a Qantas Assure health insurance policy (and use the accompanying app to count their steps) could earn up to 70,000 points in the first year -- enough to fly from Sydney to London. Each year thereafter members can earn up to 15,000 points (depending on the level of cover) for being active. “We have more than 11 million Frequent Flyers and about a quarter of all Australians are already keeping an eye on their health through wearable technology, so we think the idea of earning points for being active will appeal to a lot of people,” said Qantas Loyalty CEO Lesley Grant. The premise is pretty clever, with the belief that active clients are healthy clients, and in turn will claim less on their policy. “We support Qantas Assure’s innovative approach to rewarding people for being more active. Research has shown that walking for 30 minutes or more a day can reduce the risk of coronary heart disease by a third," National Heart Foundation CEO Professor Garry Jennings said. To launch the campaign the airline enlisted the help of actor Christopher Walken. Walken. Get it? The announcement comes at a time when health insurance rate rises are certainly topical.